Very few cases of pyogenic thalamic abscess have been reported in literature. Deep seated brain abscess like the one in basal ganglia are rare and pose clinical, imaging and surgical challenge. CT guided stereotactic aspiration is recommended modality of treatment. In rural centers without stereo toxic apparatus, aspiration of such lesion becomes technically difficult using conventional burrhole-aspiration methods. We present a unique technique of free hand aspiration of thalamic abscess under CT guidance. This technique is the first of its kind to be reported in literature. Pyogenic brain abscess are one of the commonest intracranial pathology that is encountered in a rural neurosurgical practice. The surgical treatment for abscess involves burrhole aspiration or excision of the abscess wall. Deep seated brain abscess like the one in basal ganglia are rare and pose clinical, imaging and surgical challenge. CT guided stereotactic aspiration of the brain abscess is considered a safe treatment option for deep seated cystic lesions of the brain which includes brain abscesses. In rural India, constrains in the availability of stereotactic instrument, makes this condition a rather difficult diagnostic and neurosurgical challenge. Here in this case report we present a rare case of thalamic abscess and its management. A thirteen year old girl presented with history of fever for past 5 days, followed by sub-acute onset of right sided upper and lower limb weakness. There was history of rapid progression of weakness. At the time of presentation the child was, wheel chair bound with inability to move her right upper limb and right lower limb. She had history of mild head ache with nausea but no vomiting. There was no history of seizures, memory disturbance or speech disturbance. She had history of a complex congenital cardiac defect which was deemed inoperable at the age of 3 years in a tertiary urban cardiac care centre. At presentation the child was fully conscious, alert, oriented and talking in local vernacular fluently. Fundal examination showed hyperemia with blurring of fundal margins. She had mild upper motor right facial weakness and no other cranial nerve deficit. There was MRC (British medical research council) muscle power grade of 2/5 in right upper and lower limbs, with distal weakness more than proximal. Deep tendon reflexes were exaggerated on the right side and Babinski sign was positive. There was no sensory impairment or signs of meningeal irritation. CT brain with non-ionic contrast showed peripherally enhancing lesion in the right basal ganglia involving the thalamus and upper brain stem. The peripheral enhancement was irregular and un-uniform. MRI brain was done to characterize the lesion which showed diffusion restriction in the centre suggestive of necrosis and MRS showed lactate peak in the centre with no increase in choline to creatinine ratio at the margin of the lesion. Diffusion tensor imaging showed partial disruption of the frontopontine near the superior internal capsule. Radiological imaging features were characterizing an abscess (Figure 1). Figure 1: MRI brain of 12 year old female child. a.	T1 axial image showing hypointense lesion with peripheral rim of hyperintensity with irregular margins seen in the right thalamus. b. The lesion is showing hyperintense with peripheral hypointense rim on T2 axial image. c.	The lesion showing restriction on diffusion weighted image. d.	Contrast enhanced T1 weighted image showing peripheral irregular wall enhancement of the lesion. e.	Diffusion tensor image showing diffusion anisotrophy of the lesion in right thalamus. Features are consistent with thalamic abscess. Cardiac 2D trans-thoracic ECHO scan showed transposition of great arteries, pulmonary and tricuspid atresia and a functional single ventricle. There was no vegetation visualized. Option of a major surgical procedure to excise the lesion was ruled out as there was high risk of anesthesia due to complex congenital cardiac defect and high surgical risk due to the location of the lesion in the thalamus involving the brain stem. Burr hole and aspiration was contemplated but potentially unsafe considering the relative small size of abscess and its deep location. Stereotactic aspiration was not possible due to non-availability of the equipment. CT guided aspiration of abscess was planned .We staged the surgery in two stages. First, in the operation theatre, using barium marker CT scan of head, a burr-hole was placed in the right temporal region. Later in the CT gantry free hand needle aspiration of the abscess was done using co-axial CT images (Figure 2). The aspirate was purulent with slight blood tinge. Post-procedure after 3 hours showed no intracranial bleed. 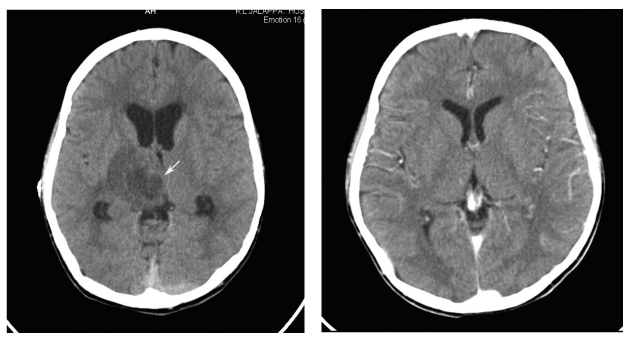 Figure 2: CT Guided aspiration of the thalamic abscess: CT axial and coronal reformatted images showing hyper dense needle passed in to the abscess cavity and needle tip (arrow head) is seen in the centre of the abscess cavity (arrow). Pus culture grew beta hemolytic Streptococci group G which was sensitive for all the clinically used antibiotics. She was initially treated with intravenous 3rd generation cephalosporin and metronidazole for 3 days later it was changed over to intravenous ciprofloxacin and gentamycin based on culture report and continued antibiotics for 6 weeks. Now she is on oral ciprofloxacin for over 1 month. One month follow up CT Brian with contrast showed no residual lesion and the child has gained near normal power in the left upper and lower limbs (Figure 3). Figure 3: a.	Pre-operative contrast CT brain showing peripherally enhancing lesion in the right basal ganglia region. b. One month post aspiration scan showing complete resolution of the abscess. Paradoxical haematogenous spread of abscess is common in patients with congenital heart disease and they occur most often at the grey whitewater shed areas, which facilitate settling of emboli [1,2]. Deep seated abscess constitute 1-6% of brain abscess and constitute a diagnostic dilemma [3,4]. Bhatia et al. in 1886 have reported 5 cases of pyogenic basal ganglia abscess of total 21 reported cases of inflammatory lesion of thalamus and basal ganglia. Abscess depending on the stage have varying enhancement pattern, a typical capsular abscess appear as smooth walled peripherally enhancing lesion thicker wall on the cortical side [6,7]. In the case we present, there was a non-uniform walled peripherally enhancing lesion which is a typical feature of abscess. MRI is useful in differentiating cystic neoplastic lesion from brain abscess. Diffusion weighted images (DWI) are highly sensitive in characterizing abscess content which appears bright on DWI . 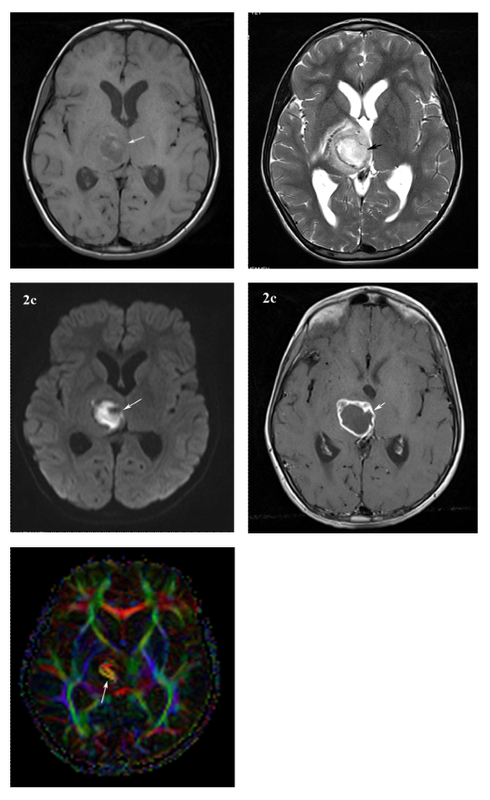 Diffusion tensor imaging is useful in demonstrating the extent of involvement of deep white matter in relation to the lesion . In basal ganglia and other deep seated abscesses stereotactic aspiration is a recommended modality of treatment [5,10-12]. Singh and Singh et al. reported 2 cases of thalamic and ganglionic abscesses treated by conventional aspiration of abscess. Burr hole and drainage for deep seated small and moderate size abscess is technically difficult and have higher complication rates. Many case series of CT guided aspiration of lesion in lung and liver have been reported in the literature . This is the first case report of use of free hand aspiration under CT image guidance for a brain abscess. In the case we found excellent immediate and long term results with CT guided free hand aspiration of abscess. The majority of cerebral abscesses in patients with congenital heart disease have Streptococci which respond to penicillin . We gave intravenous antibiotic to which the Streptococci were sensitive to for 6 weeks and followed with oral antibiotic for 3 months. In rural centers where there is non-availability of stereotaxy apparatus, a CT guided free hand aspiration of abscess can prove to be a safe and efficacious alternative to conventional burr hole- aspiration. Bergman PS, Malis LI (1950) Paradoxic brain abscess in congenital heart disease. J Nerv Ment Dis 112(5): 442-446. Hwang TL, Close TP, Grego JM, Brannon WL, Gonzales F (1996) Predilection of brain metastasis in gray and white matter junction and vascular border zones. Cancer 77(8): 1551-1555. Lutz TW, Landolt H, Wasner M, Gratzl O (1994) Diagnosis and management of abscesses in the basal ganglia and thalamus: a survey. Acta Neurochir (Wien) 127(1-2): 91-98. Dinakar I, Rao SB (1970) Brain abscess in children. Indian J Pediatr 37(274): 557-560. Bhatia R, Tandon P, Misra NK (1986) Inflammatory lesions of the basal ganglia and thalamus: review of twenty-one cases. Neurosurgery 19(6): 983-988. Britt RH, Enzmann DR, Yeager AS (1981) Neuropathological and computerized tomographic findings in experimental brain abscess. J Neurosurg 55(4): 590-603. Ng KK, Wong WK, Raju L (1976) The radiological features of brain abscess in congenital heart disease. Australas Radiol 20(4): 321-328. Chang SC, Lai PH, Chen WL, Weng HH, Ho JT, et al. (2002) Diffusion-weighted MRI features of brain abscess and cystic or necrotic brain tumors: comparison with conventional MRI. Clin Imaging 26(4): 227-236. Nath K, Ramola M, Husain M, Kumar M, Prasad K, et al. (2010) Assessment of therapeutic response in patients with brain abscess using diffusion tensor imaging. World Neurosurg 73(1): 63-68. Chang YT, Lu CH, Chuang MJ, Huang CR, Chuang YC, et al. (2010) Supratentorial deep-seated bacterial brain abscess in adults: clinical characteristics and therapeutic outcomes. Acta Neurol Taiwan 19(3): 178-183. Kawasaki H, Amano K, Kawamura H, Tanikawa T, Kawabatake H, et al. (1991) CT-guided stereotactic surgery of brain abscess. No Shinkei Geka 19(2): 143-148. Lunsford LD, Nelson PB (1982) Stereotactic aspiration of a brain abscess using a “therapeutic” CT scanner. A case report. Acta Neurochir (Wien) 62(1-2): 25-29. Singh P, Singh AP (2002) Thalamic and ganglionic abscesses: a report of two cases: letter to editor. Neurol India 50(2): 225-226. Di Donna A, Bazzocchi M, Dolcet F, Springolo E (1995) CT-guided transthoracic needle aspiration of solitary lung lesions. Personal experience in 118 cases. Radiol Med 89(3): 287-294. Askenasy HM, Kosary IZ (1960) Brain abscess in cyanotic congenital heart disease. J Neurosurg 17: 851-857.